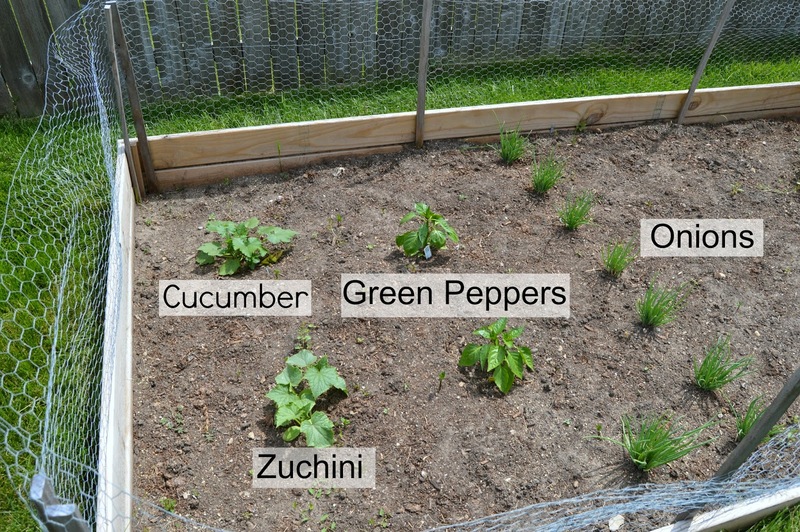 I had a goal for the last several summers to start a garden. It was something we always had when I was growing up. In my memory we had these really large gardens full of tons of produce, I could be wrong, but it always felt like there was so much stuff. Strawberries, raspberries, corn, carrots, potatoes, radishes, peppers, tomatoes, lettuce, rhubarb, asparagus, zucchini. . .and I'm sure there was more. Now I don't have that large of a yard (were talking like a 1/4 acre here) so 2 summers ago my husband and I cleared out the back corner where we knew we wanted to have our tiny garden. Then, last summer we finally got around to constructing it and actually had a summer garden for the first time. All we did is pick up a few pressure treated 1 x 6's (to withstand the elements), as well as a 2 x 2 (which we used as the corner braces), and screwed it together to make a huge rectangle. We buried part of the bottom board in the yard, then stuck in a handful of stakes which we then used a staple gun to attach chicken wire to. A must in our parts, otherwise we wouldn't get to even see anything that we were growing. There are a ton of rabbits running around, and though cute, they also like to eat everything in your garden. Even though our garden isn't huge (it's about 12 feet by 6 feet) it was so cool to see how much we got out of it last year. 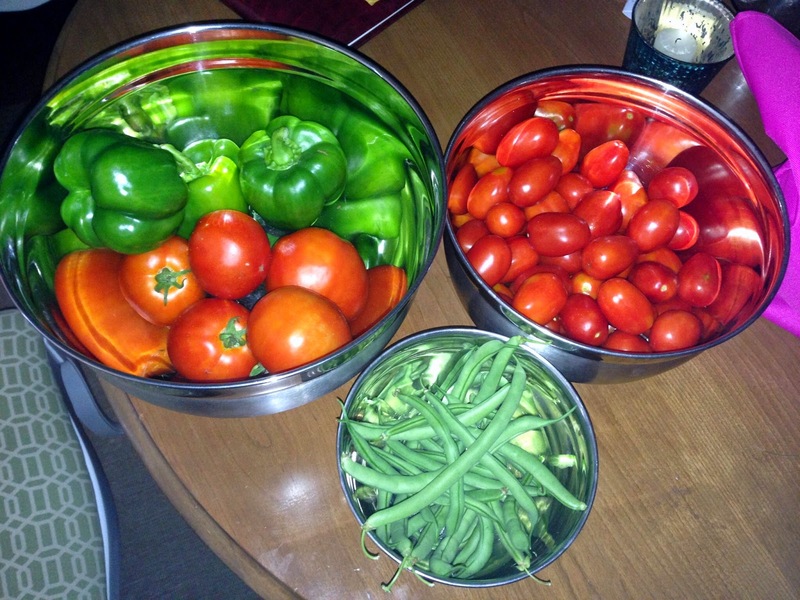 This was just one of our many harvests last summer. So we are back at it again this summer, growing some of the same things as last year, as well as trying a few new things. On the right side of our garden we've planted a few herbs. The nice thing is the chives stick around from year to year so they just keep getting bigger and crazier. 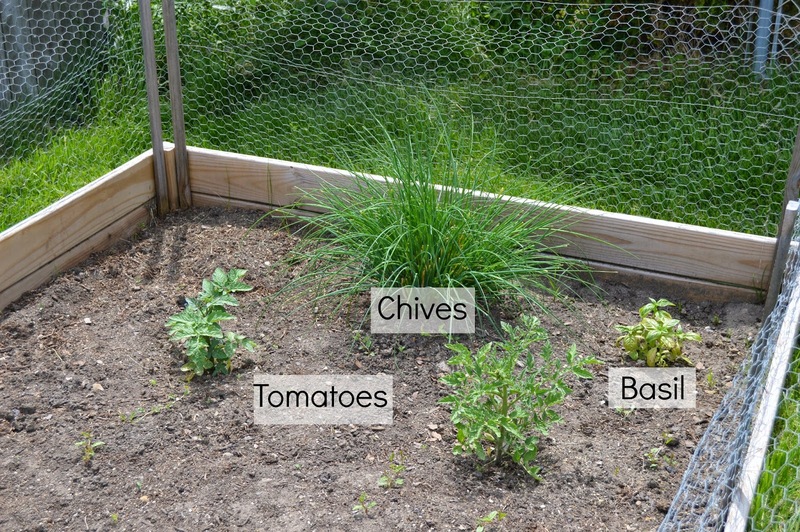 We also have basil, and still plan to add cilantro the the left of the chives. We've also planted two different varieties of tomatoes, don't ask me which ones, I just know they are different! On the left side we have a cucumber plant, new to us this year. As well as a zucchini (pardon my misspelling in the photo, spelling has never been my forte) which are so easy and great to grow, you just have to keep your eye on them because before you know it they can be the size of a baseball bat. We had just one zucchini plant last year as well and I can't believe how many we got from that one single plant. We also have two green pepper plants, and then a whole bunch of onions. We had attempted some lettuce, but it doesn't appear to have made it. Perhaps it will still sprout up, you never know. We definitely take the easy route and pick up the starter plants from Home Depot. They are a few bucks per plant and allow us to get a head start a little later in the season, versus if we were to get started from seeds. Which was especially good this year due to our extra long winter. The nice thing is one the plants are in, all they need is water and weeding. The tomatoes and peppers will need stakes once they get so big, but that isn't much work at all. I can't wait to see what we are able to grow this summer. 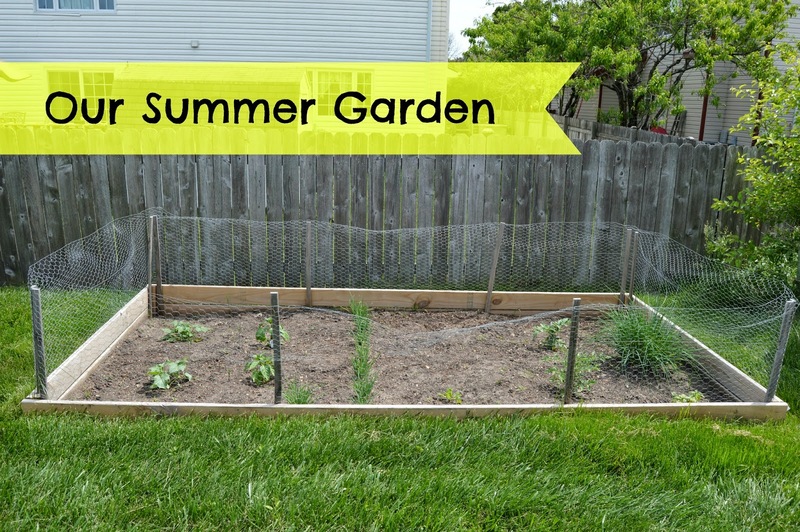 Do you have a summer garden? What are you growing this year? I have always wanted a garden though my yard is really small so no room for one but in my next house I will have one. Love fresh veggies. Cucumbers, strawberries and watermelon would be a most in mine. Your garden looks amazing!! And I am super jealous of your chives... I swear, I put chives in and on everything!! Thanks Lisa, my husband is the same way, he uses them on everything - thankfully they grow like crazy! You could always add a few plants in pots? Probably not the watermelon :) But strawberries would work!